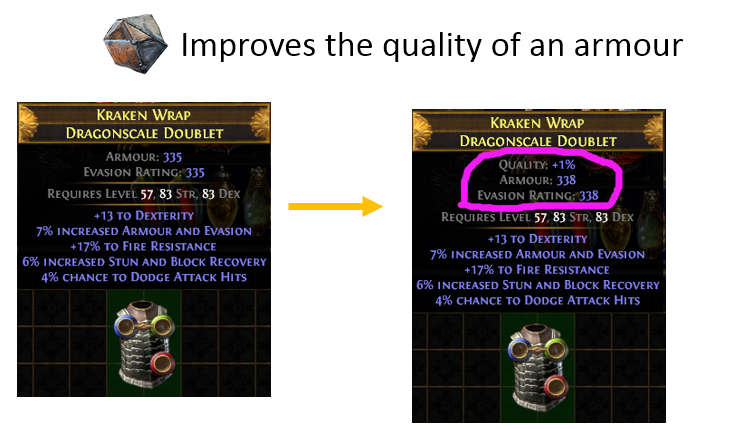 Armourer’s Scrap increases the quality of an Armour: 5% for Normal items, 2% for Magic items, 1% for Rare or Unique items. 20% is the maximum quality for any items. Meanwhile, any local defense modifiers on the item will be improved as well, such as the value of Armour and Evasion Rating. 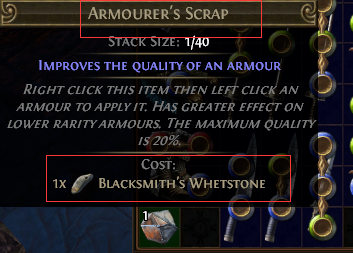 In order to apply it, just right click Armourer’s Scrap then left click an Armour. (5) Buy 200 Armourer’s Scraps for $0.28 additional 3% off with coupon “AOE”. One may acquire Armourer’s Scrap by slain enemies, using recipes, purchasing from the vendor. Open more chests and strongboxes can farming lots of scraps as well. Use recipe farming lots of scraps. 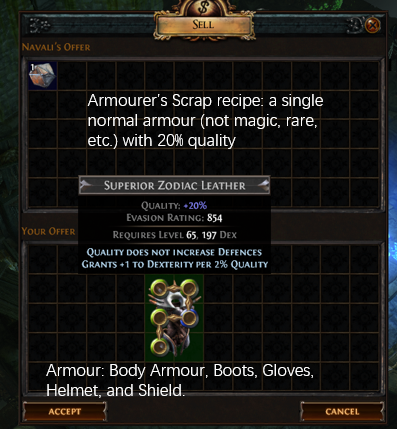 Vendor a piece of armour with 20% quality for one Armourer’s Scrap. Or, sell pieces of armours whose total quality is at least 40% to any vendor for acquiring an Armourer’s Scrap. 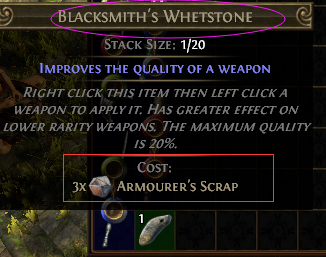 If having lots of Blacksmith’s Whetstone, one can exchange for scraps with the vendor. Tarkleigh lives in Lioneye’s Watch in Act 1, selling Armourer’s Scrap for one Blacksmith’s Whetstone. These have a downgrade for Armourer’s Scrap to vendor 2 Scrolls of Wisdom. These divination cards exchange currency randomly and cannot guarantee for Armourer’s Scrap. Greust lives in The Forest Encampment in Act 2, sell one Blacksmith’s Whetstone in exchange for 3 Armourer’s Scraps. 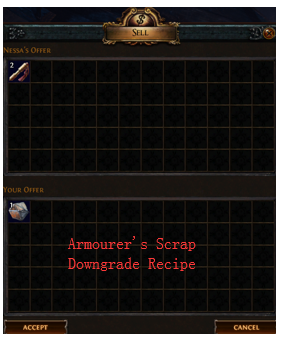 When farming hundreds of Armourer’s Scraps, one can trade from Chaos Orb. Currently, the ratio is 400 Armourer’s Scraps in exchange for one Chaos orb.